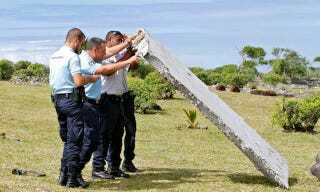 Réunion Island, east of Madagascar in the Indian Ocean, has become the focal point of global scrutiny as a suspected Boeing 777 flaperon, a tattered suitcase and now a door have emerged from the sea. They’re all suspected clues in the search for MH370, but has more evidence been unknowingly burned in a trash fire? According to the Brisbane Times, a local man named Nicolas Ferrier has come across other potential clues to the missing aircraft over the last few months, including a blue seat resembling an airliner’s. Malaysia Airlines 777-200 aircraft (the same model as MH370) feature blue seats in the business class cabins. Ferrier’s job is to comb the black sand beaches along Réunion’s eastern coast, keeping them free from debris and refuse. At the end of the workday, he burns his findings in a pile on the sand. With this in mind, it’s impossible to say how many potential clues in the disappearance of MH370 have been destroyed. Ferrier didn’t realize his discoveries could have represented a turning point in the sixteen-month search for the vanished 777 until news of the flaperon-like object’s discovery on Réunion just a few days ago. At the time, he reasoned the seat could have come from a bus or a hang glider. Ferrier added that he had also found multiple suitcases “full of things,” which he also burned in the same pile as the seat. Apparently, Ferrier sees so much random junk wash up on the shore that he just didn’t think anything of the parts and pieces that could belong to the missing plane. He even remembered seeing the suspected flaperon on the beach in early May, and described it as having living barnacles on it at the time. In the 16 months since Malaysia Airlines Flight 370 disappeared from radar, wide-ranging theories have emerged as to the doomed aircraft’s final fate. Few, if any, of those theories have accounted for debris of the aircraft (and evidence in solving the mystery of the tragedy) being inadvertently destroyed. We can only hope that this means more clues will be discovered soon, and a sharper image of the puzzle might begin to materialize.